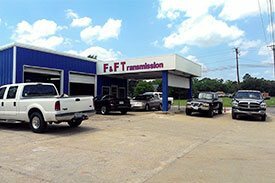 Since 1993, F & F Transmissions has provided motorists in the East Texas area with comprehensive auto repair services that include Transmission Repair, Brake Repair, Routine Maintenance, and other General Services. Our goal is to help your vehicle retain its value and stay on the road longer. Located in the Kilgore area, we service the following communities: Henderson, Longview, Tyler, Spring Hill, Gladewater, Overton, Mount Enterprise, Starville, Troup, Arp and surrounding areas. As a local, family owned and operated automotive repair shop, customer service is at the heart of everything we do. This is why we employ a knowledgeable staff with years of experience working on both domestic and import vehicles of all makes and models. For a high-performing vehicle, trust F & F Transmissions with your car, truck, or van. Read more about our Staff and Mechanics. Our goal is to help keep you in a safe, reliable vehicle longer. You can learn more about the services we offer here.